Using CAD all day I had to get a proper mouse, with the right ergonomics and components to make it last and make it fun again. Did a little survey on gaming mouse and found out that I am a palm user (mouse grip wise) so I decided to get the Kone XTD. I had to disabled all LED’s and made it as common as possible for office work. The nice thing about it is that it has two thumb buttons that I have customized as Enter and Escape, my two commands I use mainly on the keyboard. 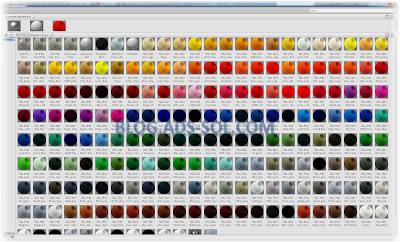 You can make your own macros stored in the mouse that will work on any other computer. 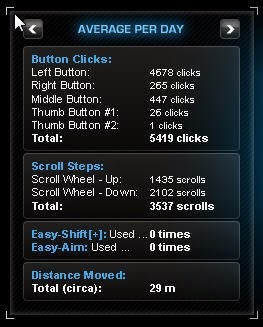 The other day I was looking over the stat’s page and realized that I am doing around 5500 clicks, 4000 scrolls and about 30 m travel (on max speed) EVERY DAY. 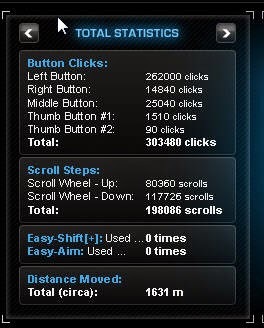 In 1.5 months I have done 300k clicks, 200k scrolls, and around 1700 m (on max speed). Fortunately it’s still holding strong and I hope to have it for a long time. 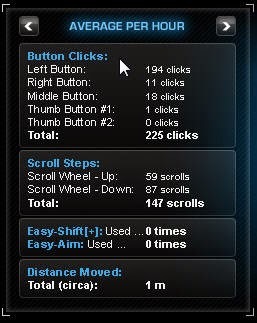 I was looking to get the Logitech MX but it has an infinite scroll meaning that the wheel will spin without control at the smallest touch and you don’t want that in AutoCAD or Inventor for that matter.